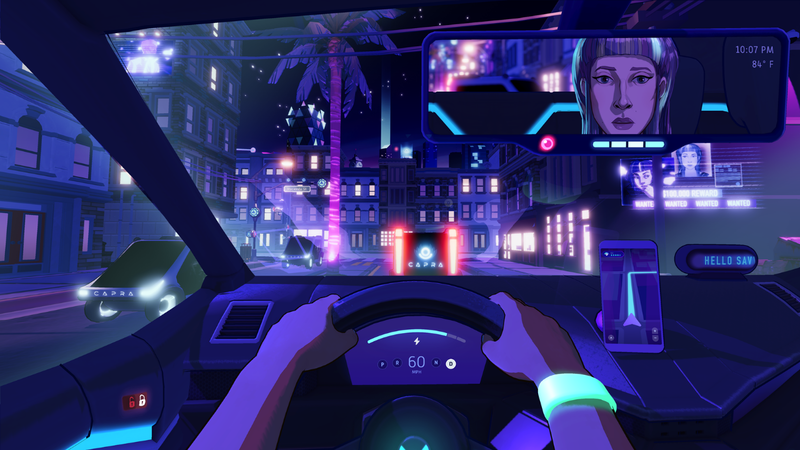 Chance Agency's unique narrative-driven game Neo Cab is coming to Nintendo Switch, bringing a dystopian tale to the handheld system. The news broke during today's Nindies Spring Nintendo Direct, and it definitely took viewers by surprise. Neo Cab puts you in the role of Lina Romero, who works as a Neo Cab driver – think a futuristic Uber or Lyft driver. She's one of the last human cab drivers in the world, because that job is going to automated cars – sounds a little like the future we're headed to, huh? The game finds you interacting with various folks who hop into your cab and ask that you drive them around town. It may sound kind of dull, but it's actually an extremely interesting character study, especially when you factor in all the different types of riders you'll pick up, their strange stories, and the meta-narrative that follows Lina as she tries to get in touch with her friend Savy. I had the opportunity to check out Neo Cab during PAX West 2018, and came away impressed with the time I spent in-game. "The game's been on my mind nearly every day since I left the booth, and I've ben aching for more ever since I hopped into the Neo Cab. I'm longing for more of the cyberpunk vision of the future, its expressive characters, clinically cool techno, and Lina Romero herself. Unfortunately, I won't be able to give the full thing a go until it finally drops sometime in 2019. Make sure you mark this one down as a must-play on your calendars," I reflected on the short demo. Neo Cab is targeting a summer release on Nintendo Switch, so make sure you check it out when it debuts!